You'll be £8.00 closer to your next £10.00 credit when you purchase Voices From the Past: Channel Islands Invaded. What's this? In the summer of 1940 the British Isles stood isolated and alone facing the might of a seemingly unstoppable German war machine. Never before had the United Kingdom been in a state of such uncertainty and possible peril. Fortunately the full breadth of the English Channel held back Hitler's armies, and his ambition. Not so for the Channel Islands which stand just a few miles from the French coast. To abandon British territory to the enemy was unthinkable, yet the defence of the Channel Islands was impracticable, if not impossible. It was decided, therefore, to evacuate as many as wished to leave. This is the story of the muddled evacuation, of homes, animals and families left behind, of the German bombing of the islands, the fear of those left behind, and of those first days of German Occupation, told by the Islanders themselves through memoirs and letters, the local newspapers, and the politicians who decided the fate of tens of thousands of men women and children. 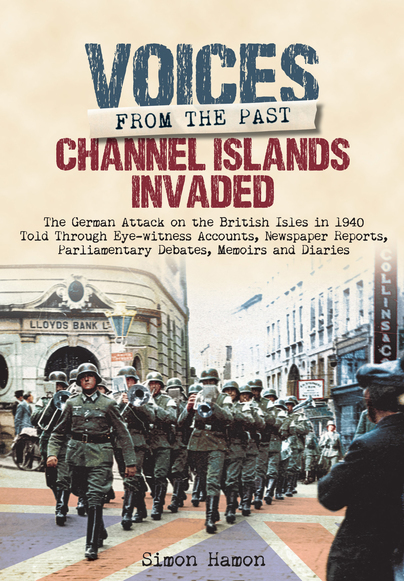 Told by the people who were there, Voices From The Past delves in to the chaotic scenes on the Channel Islands as Hitler's Blitzkrieg arrived and occupation ensued. [This] is a fascinating tale, told in an inventive and enjoyable way.